November 19, 2018. We received an email from Harry Morgan at Sparkman & Stephens that Toney Edwards has passed away losing a battle with pancreatic cancer. His wife is selling Belle and we will have a detailed ad in coming days. She is in the water. 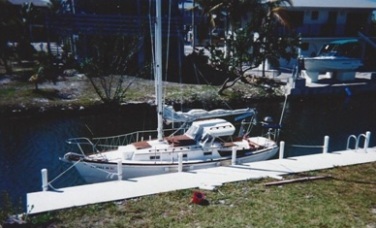 Awlgrip hull, deck and mast. New jib tracks and vang. New canvas (sail cover coming). Meanwhile, below are some photos Harry sent us. December 8, 2018 We got the following email from Linda Kveen, daughter of Rodney Thorpe, prior owner of #91. This morning I checked your website (after a long absence) and found to my great shock that Toney Edwards had passed away. 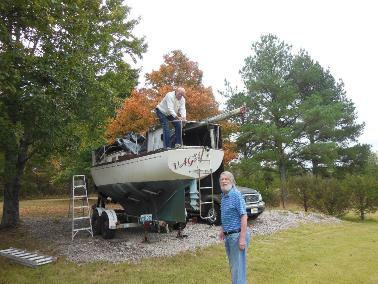 In October, 2017, he had traveled to Missouri and purchased my dad's boat. My dad is Rodney Thorpe and he was the original owner of Vaga,Yankee Dolphin #91. The last my dad had heard from Toney, he was happily restoring the Vaga and had renamed her Belle. We would both like to offer our condolences to his family and friends. We did not know him well but when we met him in Missouri, we were stuck by his energy and enthusiasm. 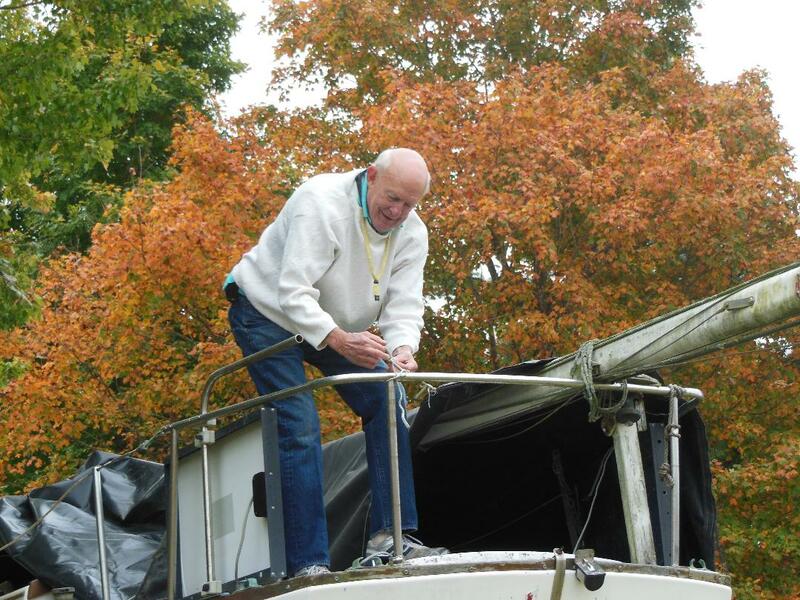 We hope that restoring Vaga gave him much joy in the last year of his life. I have attached some photos of his visit to Missouri with Vaga and my dad. May he rest in peace. October 16, 2017 Toney Edwards checking in as the new owner of Vaga, Yankee #91. Over the past year your webmaster and Toney have been in touch regarding his search for a Dolphin. 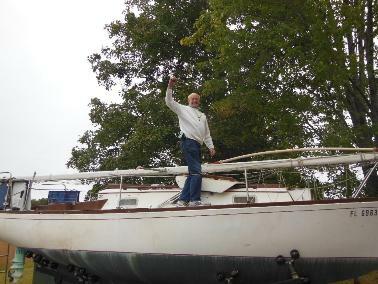 He has had the good fortune to sail on Peggy Comfort's Sloop du Jour so he knew what he was looking for! We'll stand by for reports and photos. Happy to inform you that Vaga #91 is no longer deteriorating in a field in Ironton, Missouri, but is now in Stuart, FL. and making all due plans to get sailing ASAP. Thank you for your efforts on behalf of the Dolphin. 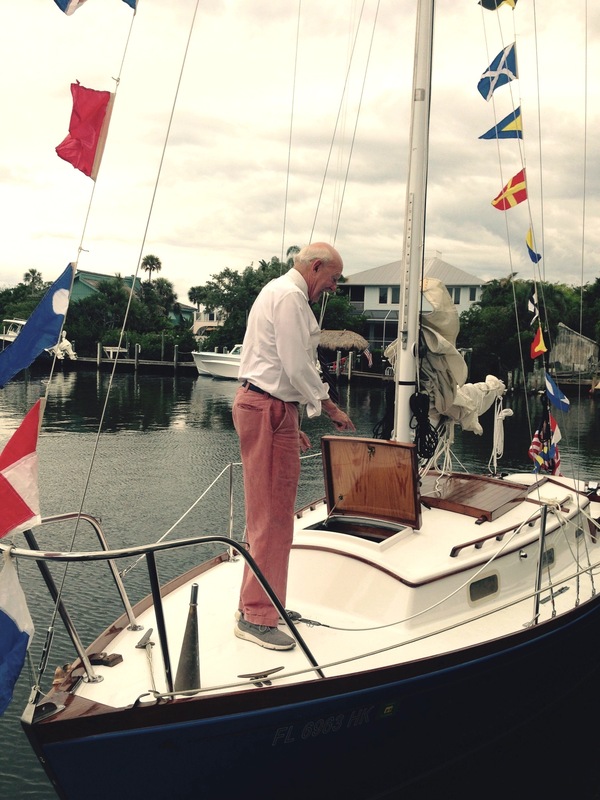 Perhaps a future regatta in Florida for Florida based Dolphins to rival the Camden event…? There is, of course, a fun story to be told, in operetta format, about the adventure of my final move from NYC (end of September) to Stuart, Florida, and a mere few days later, driving to Missouri in an old Expedition with a friend to rescue Vaga from a field where she sat sleeping for 10-12 years. After a cursory 30 min. visual inspection, and a night of Dark & Stormys, we hooked up the trailer the next day with Vaga on it and drove to the nearest (only?) tire place in Ironton, MO, replaced the trailer tires, loaded the wheels up with grease, replaced all the trailer wiring & lights, acquired a temporary MO paper trailer plate, and returned to Stuart; all within 4 days. 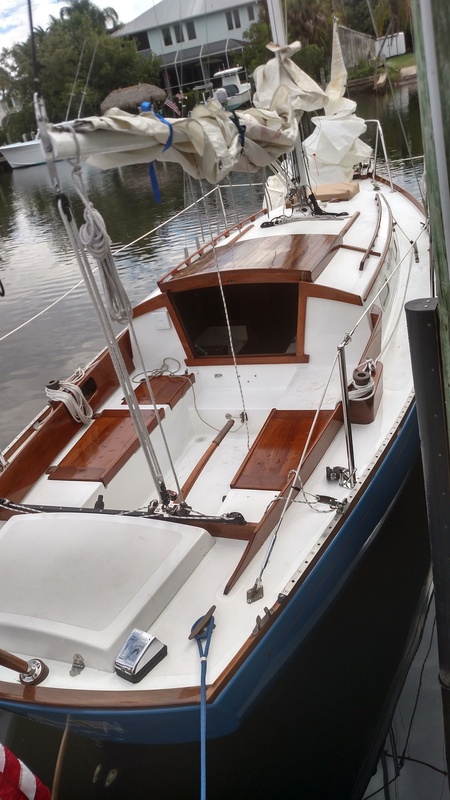 Many more details at a later time, but here she is 3 months later, stripped of 2000lbs of anchors, chain and other crap, and painted with teak trim up to snuff. 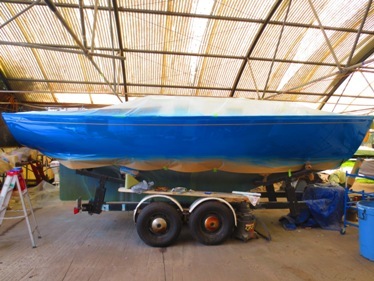 Further details and documentary photos to come when I’m finally in the water around the first of March. You have been an inspiration and fountain of technical knowledge. All appropriate ceremonies were followed to un-name Vaga and apprise Neptune of the retiring of the old name and requesting to have the new name, BELLE , accepted by all appropriate Gods. 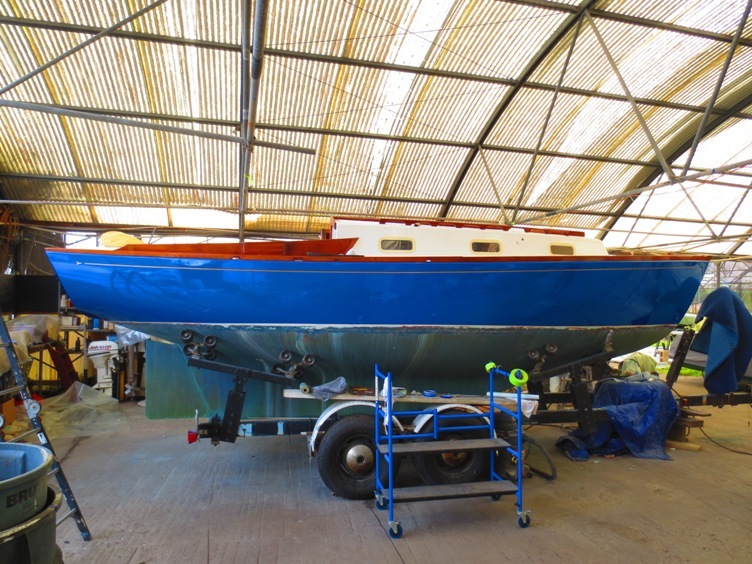 Photographs will follow shortly to be followed up by a short memoire of retrieving her and restoring her. 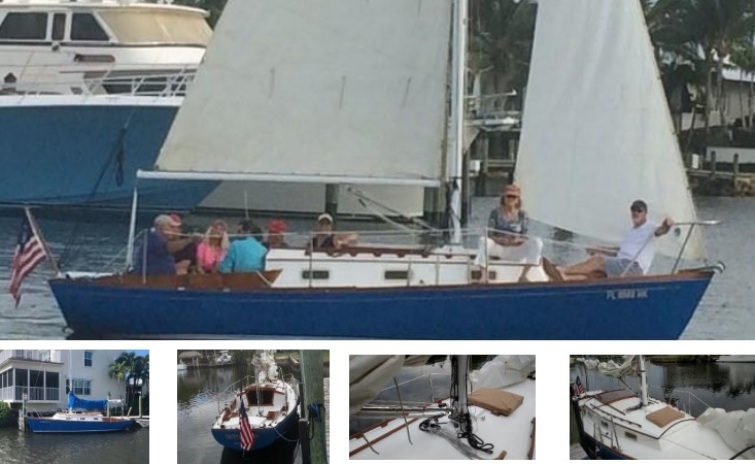 I have enjoyed reading your great website and seeing how many sailors appreciate the wonderful Yankee Dolphin 24 boats. My father, Rodney Thorpe, who is 83 years old and now lives Ironton, Missouri, wants to sell his boat, the Vaga. He spent many wonderful years sailing it in the Channel islands in California and in the Bahamas. 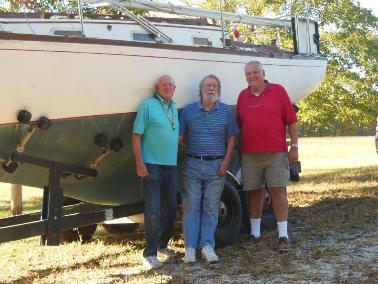 He also lived aboard it for 13 years, two of them in the Bahamas. 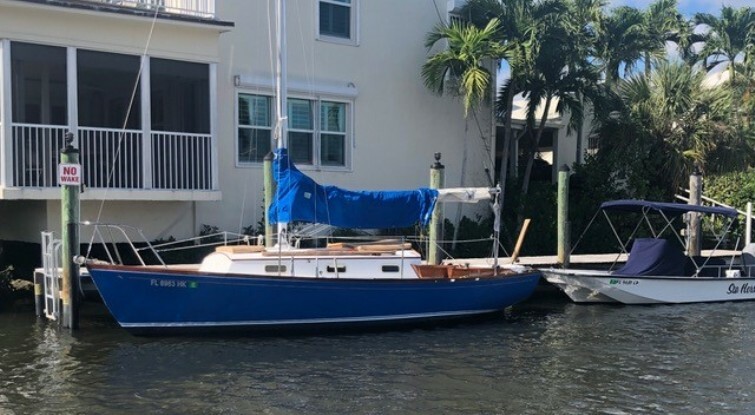 Unfortunately, his sailing days are over and he has asked me to help him sell it to a good home. I am hoping you can put the information about the boat on your website. 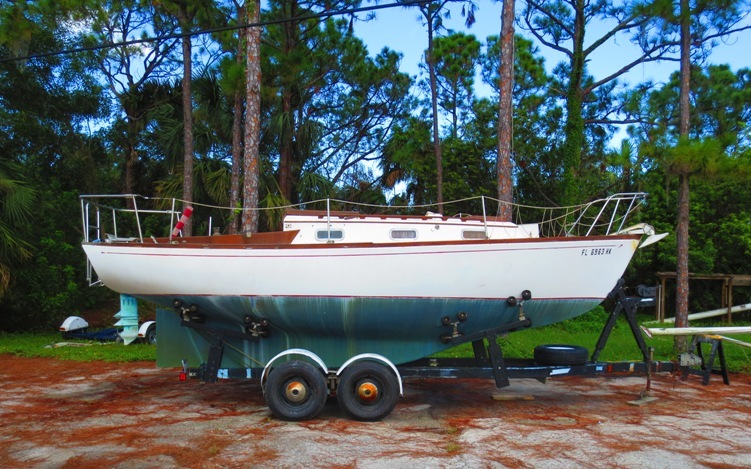 This 1968 Yankee Dolphin 24 is one of 37 custom built boats and has a mahogany interior. 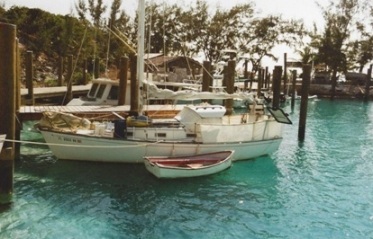 The owner, my father Rodney Thorpe, lived on it for 13 years, two of them in the Bahamas. Anyone who is interested can e-mail me (Linda Kveen) at dkveen@sbcglobal.net. I am acting on my father's behalf. He is willing to speak to serious buyers only and go into further detail about the boat. 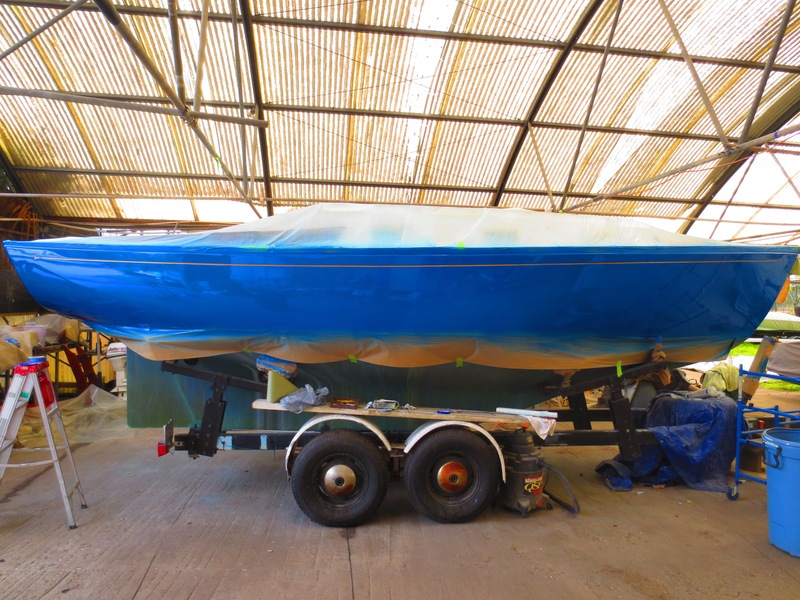 It is a great boat and we hope to find some one who will appreciate it. Attached are some photos of when the Vaga was in Florida. I have just discovered the site. I used to follow the old one. 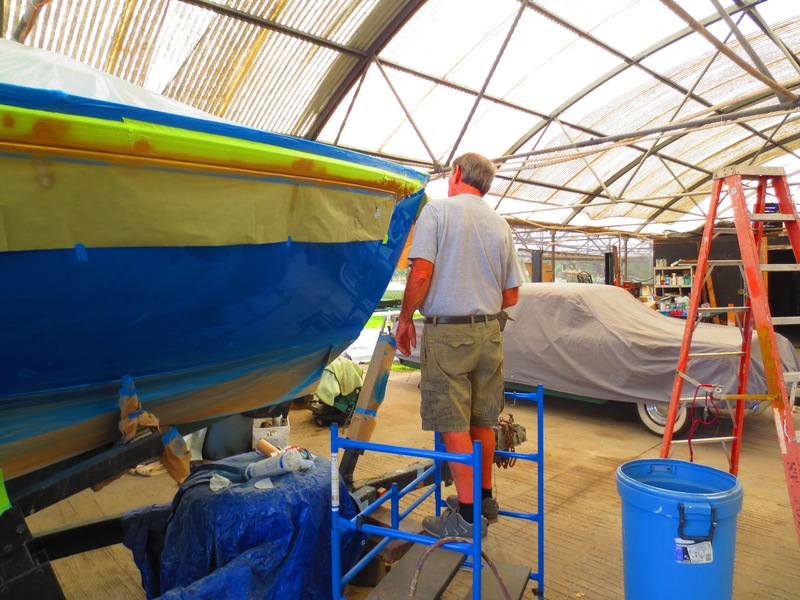 I bought my boat new from John S. in May, 1968. 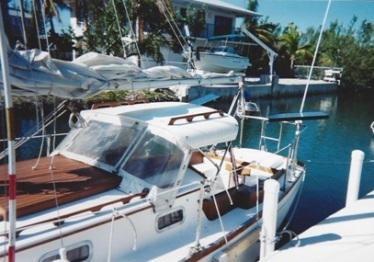 The boat was on Gangway 28, in the Long Beach Marina. 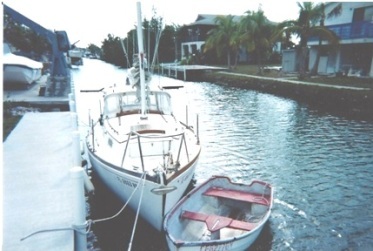 I sailed most of the Channel Islands and then, in 1995, trucked it to Houston, Texas and traveled the waterway to Destin, Florida. Went back to California for two more years then trucked to Marathon, Florida and then over to the Bahamas where I spent two years. The boat is now on a trailer in the front yard. I live in south east Missouri. I lived aboad the boat for 13 years very happilly.